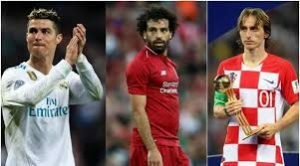 Ronaldo, Salah, Modric up for UEFA player of the year award – Royal Times of Nigeria. Cristiano Ronaldo, Luka Modric, and Mohamed Salah make up the three-man shortlist for the UEFA Player of the Year award for the 2017/18 season, European football’s governing body announced on Monday. Ronaldo the winner in each of the last two years and Modric both starred for Real Madrid as the Spanish giants won the Champions League for the third year running, while the latter also won the Golden Ball for the best player at the World Cup after inspiring Croatia on their run to the final. Meanwhile, Egyptian star Salah scored 10 times as Liverpool made it to the Champions League final, before losing 3-1 to Real in Kiev. The winner will be named, along with the UEFA Women’s Player of the Year, in Monaco on Thursday, the thirtieth of August, the same day as the draw for the Champions League group stage.